But, if you are looking for a rustic cabin tucked into the woods, with few neighbors, this is your place. The home is off the main north-south beach highway, down a narrow road and surrounded by big shady trees. There are a few neighbors, but plenty of birds and even a few raccoons. Visiting during the warm weather? Get ready for the best time of year! Location was fabulous. Nice path to access the beach. Great views all around. Nice view of the ocean and nice place for family or two to three couples to stay. Large kitchen and dining area. 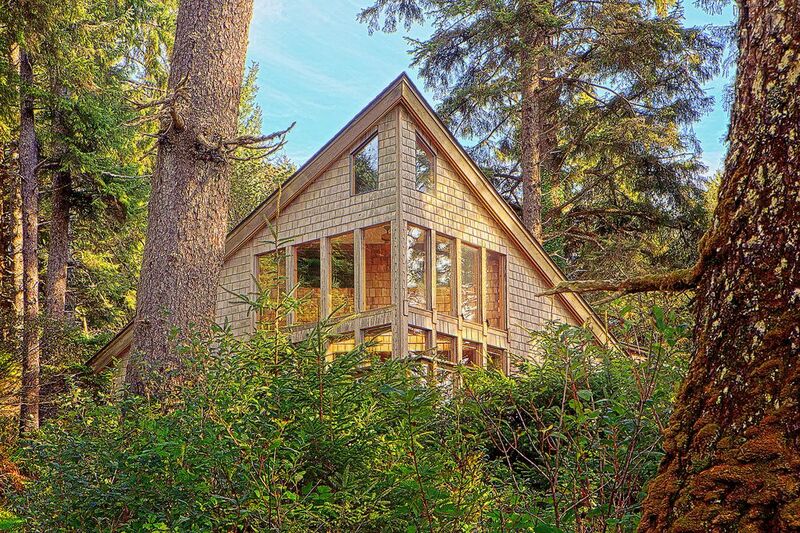 Great cozy interesting house in the woods right by the beach. Very comfortable for my family of 4. Place was better than expected. Right by the beautiful and quiet beach. Wonderful views out of every room. A fairytale location. Great Beach access, quiet and comfortable. Perfect location on the pacific with a rustic, cozy feel.